Theresa May (left) and Andrea Leadsom (right). 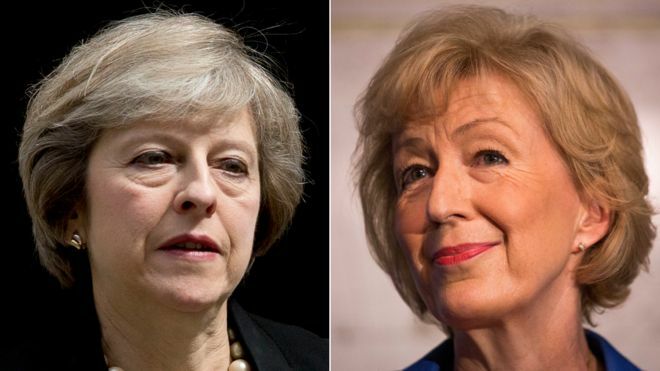 The ballot of MPs has narrowed the initial five candidates down to two: Theresa May and Andrea Leadsom. They will now go to a ballot of the party membership. May's record as Home Secretary does not inspire much confidence. She has presided over needlessly cruel and inflammatory treatment of immigrants, which reached a low point in sending vans to drive around London with a "Go Home" message painted on the side. She might have done this out of expediency and personal ambition; or worse still, because she believed it was the right and proper thing to do. That said, May has run an important and disaster-prone department of state for six years, without any career-ending blunders. She has shown an interesting and un-Tory willingness to pick fights with the police union. She may not be a kind person, but indications are she is a rational one. She appears to recognise there is such a thing as reality, as distinct from her own imagination. If May becomes Prime Minister, she will find it expedient to enact bad and cruel policies. She will not show any remorse. Her public image is built around being a less warm and humane version of Margaret Thatcher; but we can at least hope for competence and pragmatism. It's small comfort, but given the alternative, we must appreciate what we can get. Leadsom is not encumbered by any inconvenient facts. She has enthusiastically supported the many falsehoods told by the Leave campaign. In a sane world, this alone would disqualify her from high office; in our world, it may be the very thing which propels her to victory among the Conservative membership. Over and above that, Leadsom shows a worrying indifference to reality. She thinks it is possible to rate and censor the entire Internet. She has shamelessly exaggerated her own CV. Our next Prime Minister could be a person who does not care what is real and what is not. If Leadsom is as far out of her depth as I suspect, she might not remain in office for very long; but it could be long enough do a great deal of damage. To my horror, I find myself hoping that Theresa May wins. The long-awaited conclusion of the Chilcot Enquiry has confirmed what anti-war campaigners said all along: The Iraq War was based on weak and unreliable intelligence; Saddam Hussein did not pose a threat to the UK; war was not a last resort; and the lack of planning for the aftermath was irresponsible, inexcusable, and cost hundreds of thousands of human lives. I marched against the war, and I take a little satisfaction in seeing these conclusions. It is too late to do Iraq any good; but at least this weighty report, issued with the full authority of the British state, may encourage future governments to think twice before going to war. Tony Blair, predictably, has said he stands by the decision to invade Iraq and would do it again. There has been a great deal of argument over his sincerity, but it seems to me this is asking the wrong question. We're an empire now, and when we act, we create our own reality. And while you're studying that reality -- judiciously, as you will -- we'll act again, creating other new realities, which you can study too, and that's how things will sort out. We're history's actors... and you, all of you, will be left to just study what we do. Say what you will about Tony Blair, he was an exceptional salesman. He could package up the least promising products, and make them look shiny and exciting. It is no coincidence that he was trained as a barrister. I am a scientist. I have been trained to study empirical reality. If a scientific idea is wrong, it does not matter how sincerely and passionately anyone supports it. The idea must be discarded. It must stand up to the most rigorous possible testing and measurement, or it will not stand at all. The job of a salesman or a lawyer is very different. Reality is what your audience believes it to be. If consumers believe your breakfast cereal tastes better than the rival brand, that will take on its own reality, regardless of whether they could tell the difference in a double-blind trial. If a jury believes the defendant is not guilty, then in the eyes of the law, he is not guilty. Facts are there to be manipulated, spun, or ignored according to convenience. Ultimately, the law is what the institutions of the state say it is. In Blair's case, his legalistic mindset dovetailed with a distressing lack of critical thinking. Having convinced himself that invading Iraq was the right thing to do, he proceeded to push the case for war with all his might. He did not seem to understand that the UK and USA were not omnipotent; that in Iraq, their word was not law and never would be; that powerful forces in the region did not care one whit about democracy, human rights, or Tony Blair's opinion. Blair didn't have to listen to the pacifists. Instead, he could have heeded his own former Foreign Secretary, Robin Cook, who demolished the case for war in his resignation speech to the House of Commons. He could have listened to Jacques Chirac, the conservative President of France, who had personal experience of fighting an insurgency during the Algerian War. He could have listened to General Eric Shinseki, former Chief of Staff of the US Army, whose estimated several hundred thousand soldiers would be needed to maintain order in postwar Iraq. Shinseki's political masters in the Bush administration ignored him and invaded with a much smaller force, with disastrous consequences for Iraq and the wider world. Now Blair stands in front of the television cameras, and acts as if the catastrophe of Iraq was a total surprise to him. Aw, shucks; of course it's really bad, but I meant well, so that's all right, isn't it? No, it is not. It was Blair's duty to ask the hard practical questions, not just those he found interesting or convenient. He did not do so. There has been a lot of loose talk about Blair being a liar and war criminal. Chilcot's verdict was that he spun, stretched, and omitted information, but did not tell any direct lies. It seems that under international law as it applies to the UK, starting a war based on shoddy reasoning is not something for which leaders can be held personally responsible. Blair is unlikely ever to answer in a court of law for his misdeeds. However, Blair is fond of invoking the judgment of history. The Chilcot Report is a historical document, the product of meticulous research. The verdict of this weighty slab of history upon Tony Blair is not kind. As with the Conservative leadership, we must appreciate what few glimmers of light can be found in a gloomy and depressing situation.
" In my experience, the problem with lawyers operating outside the legal profession is that the argument is their entire focus, never mind its financial, ethical or technical merits."